We are offering Solar Panel Structure to our clients. The whole structure are made of Strut channel only. All legs and vertical column are also strut channel. Manual screw tightening is not even across the structure which results in vibration due to wind. Therefore the structure becomes loose over a period of long time. 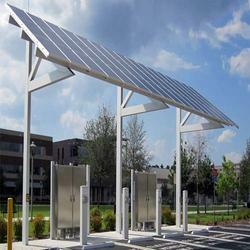 Being a well established organization, we bring forth an excellent assortment of Solar Module Mounting Structures. · The Fixing arrangement is simple and can be Fixed in a Few Hours.